recovered by anyone skilled at data recovery. 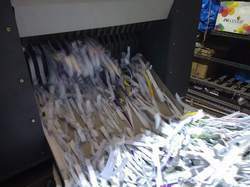 We will securely destroyed your documents thru shredding machines and provide you the certification of destruction. Would you entrust your corporate waste in the hands of someone who is anonymous Corporate waste carries unimaginable amounts of information, which could land in the hands of miscreants. Crown can recommend a rewarding corporate waste destruction solution. Data is an integral part of all electronic equipments. We ensure that there is no leakage of data from the e-waste we receive at our facility. Options available for Data Destruction include Physical Destruction, Degaussing, Drilling any other mechanism as per the Company’s IT policy. breach or loss is now a legal matter. Complete confidence in data destruction demands a high degree of trust and a fastidious adherence to process. Being a well-known organization with the latest market trends, we have come up with an attractive range of Data Destruction Services. In tune with defined industry norms, this service offered with the help of well-qualified professionals. Furthermore, our valued clients can avail this service at leading market prices. Our data destruction services enables 100% destruction of confidential data. Data is an integral part of all electronic equipments. We ensure that there is no leakage of data from the e-waste we receive at our facility. Options available for Data Destruction include Physical Destruction, Degaussing, Drilling any other mechanism as per the Company’s IT policy. Glodyne’s IT Asset Disposition and Data Destruction Service provides a tailored approach to maximize customer financial objectives while ensuring destruction of all resident data in a fully compliant manner. On-Data destructive – parallel install, data backup and then OSRI.